I know I said Moroccan food wasn’t just about tagine and cous cous. 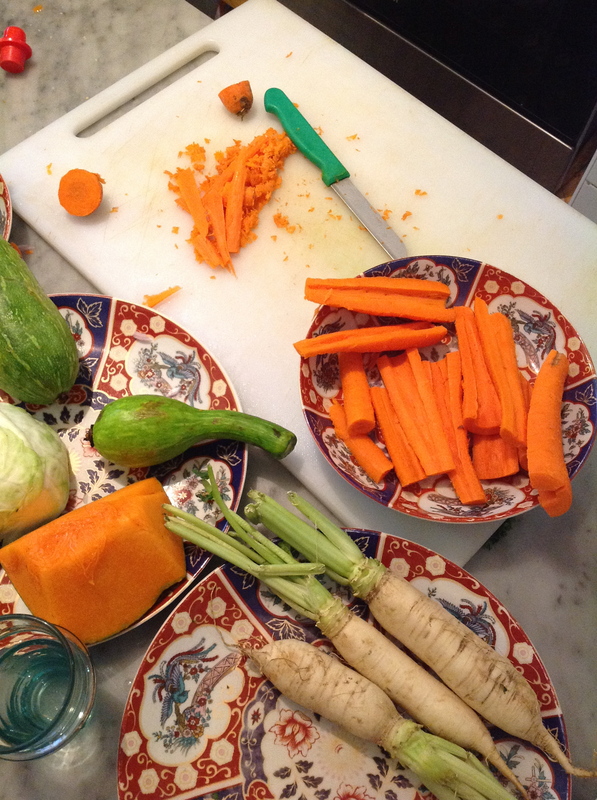 But for one meal, everyday, a tagine was. And not just at my table. 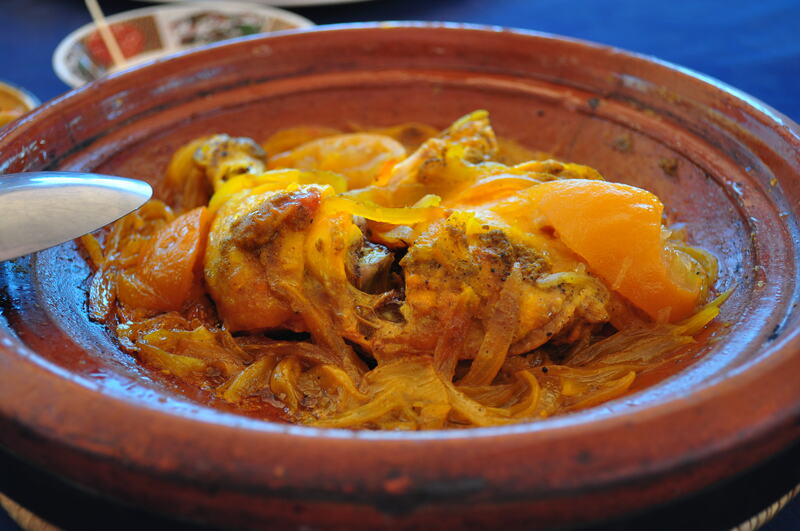 A tagine (or tajine), is a Berber dish originally from North Africa. Essentially a slow-cooked stew of meat and vegetables in a fragrant sauce. The dish gets its name from the earthenware clay pot that it’s cooked in – a flat base dish and conical or dome shaped top. What’s unique about the design is it promotes the retention and return of moisture to the bottom of the dish, like a Moroccan microwave really. And it also acts as a serving plate once cooked – so less washing up. Shop keepers in the medinas, living too far away to travel home for a meal, would set-up a little camp stove in a corner somewhere, and cook a tagine. An easy and cheap meal to make because it involves slow simmering on a low heat, less-expensive cuts of meats can be used. Just add any veg and a few simple spices, pop the top on and let in all cook in its own goodness while you hawk your wares. 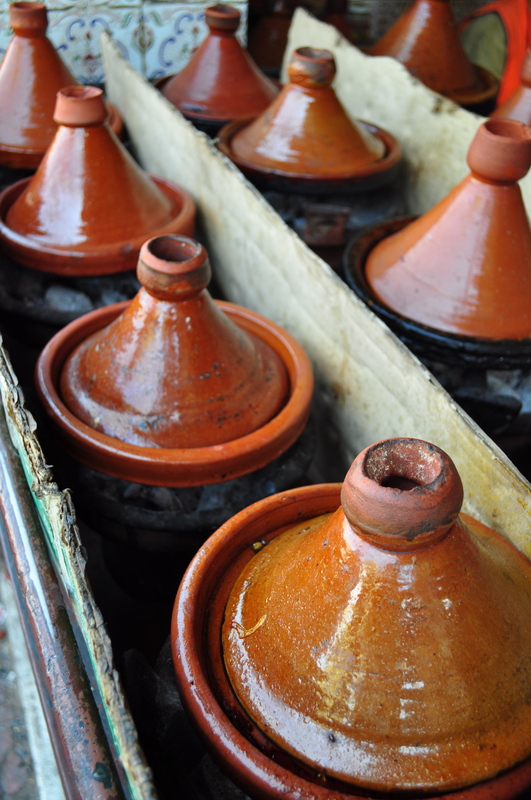 At cafes in towns and on roadside stalls, the tagine stand would be front and centre – little red hats bubbling away over hot coals – a small tagine for one and a large for sharing. All your need is bread. 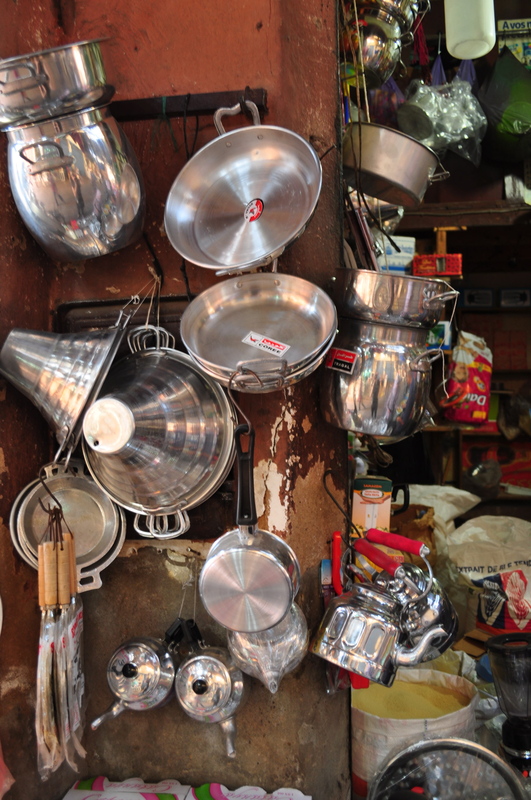 A lot of tagines are cooked in pressure cookers, to save time. But these won’t come with the lovely caramelised meat and vegetable bits stuck to the bottom of your clay pot… best scrapped off and eaten with your bread. Yum. 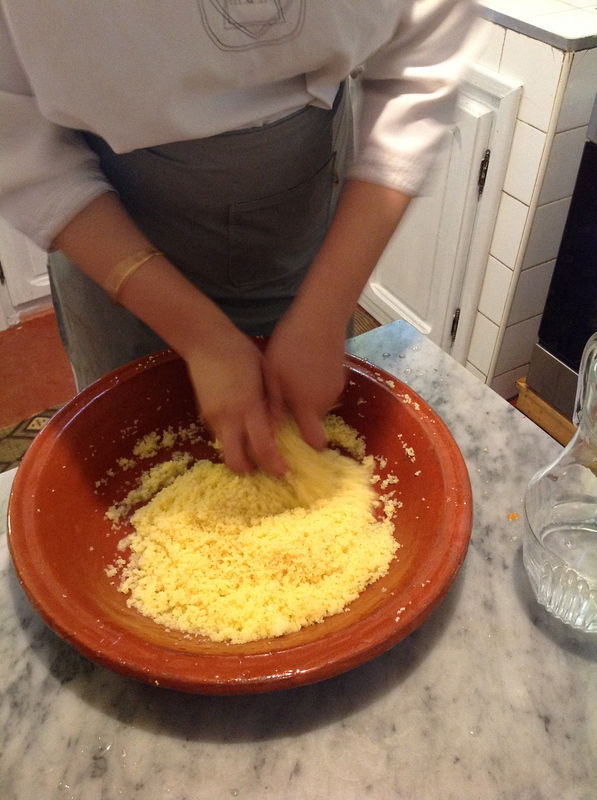 As for cous cous – although the most well-known dish – it didn’t make so much of an appearance on my plate. 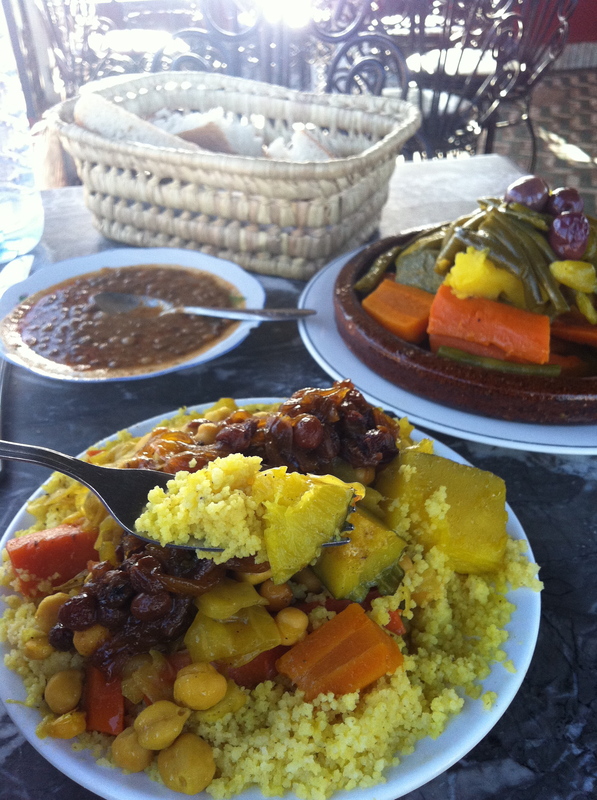 For a lot of meals I ate what my Moroccan or Berber companions were eating. And the only time I ate cous cous was when I ordered it. 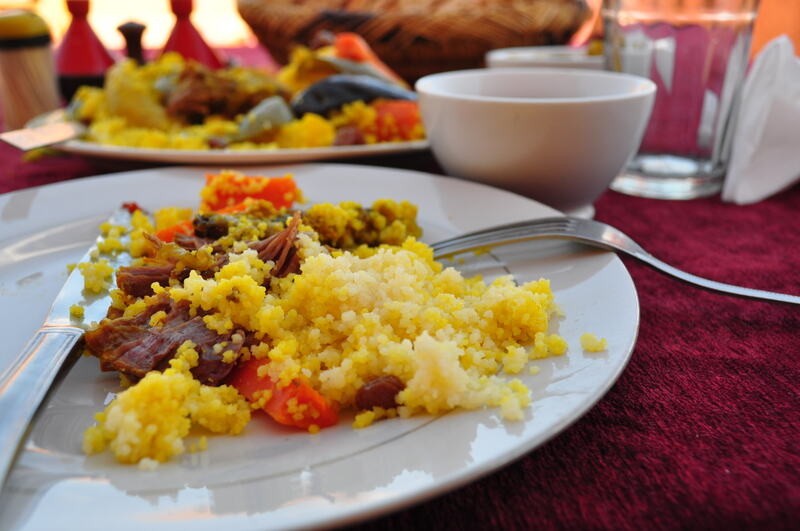 Traditionally cous cous is eaten on Friday because in some parts of the country, this is still a day of rest – so they can enjoy a big cous cous lunch followed by an afternoon of prayer and a snooze. Although I didn’t learn how to hand roll cous cous, I did learn how to cook it properly (see below) – steamed over a lovely broth instead of ‘just-add-boiling-water’. 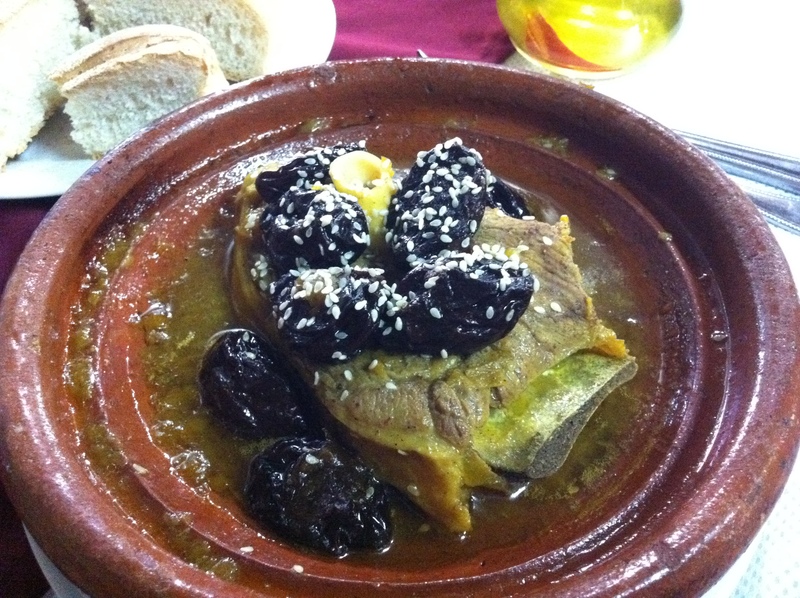 Tagine with lamb, prunes and sesame: My first tagine in Moroccoo. Sweet sticky prunes and lamb that was falling off the bone. 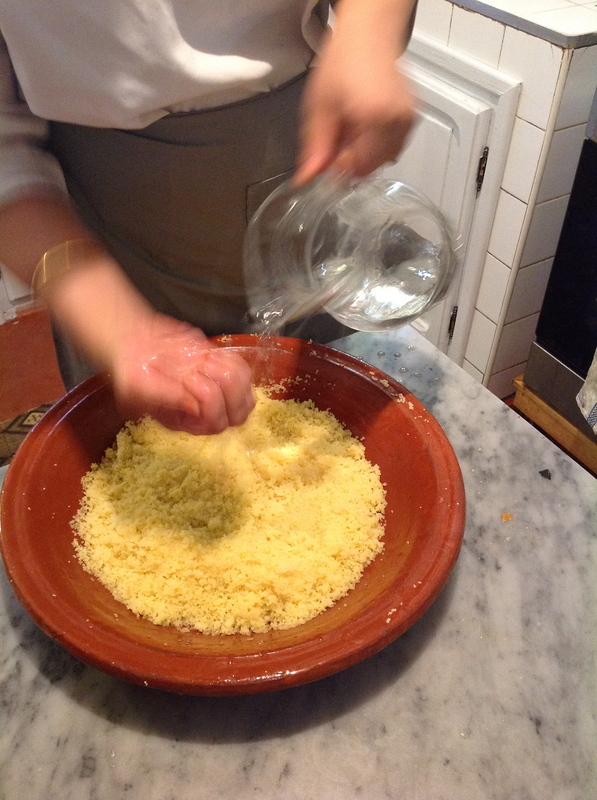 But rather oily – even if olive oil is a local speciality where I found this, in Meknes. Tagine with chicken, lemon and geeen olives: Backing up after lamb tagine for lunch. 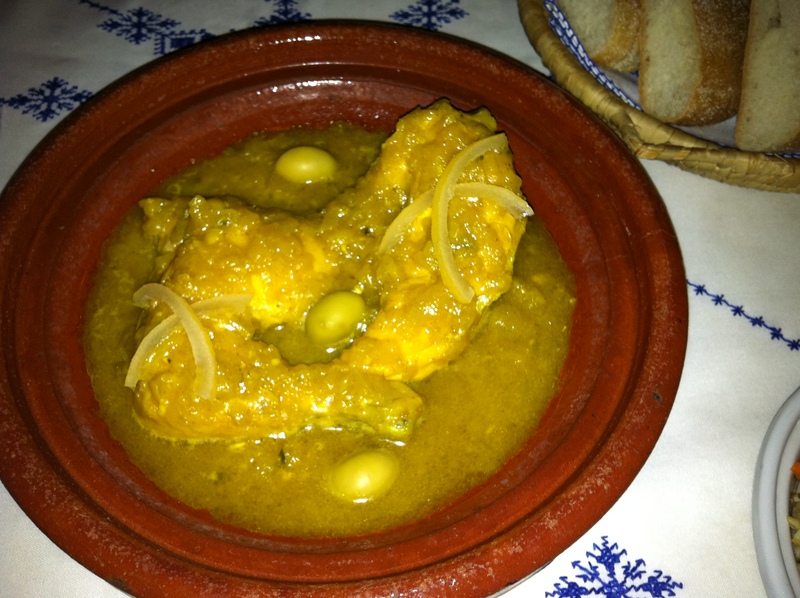 Lovely succulent chicken with a preserved lemon and onion sauce prepared by Zhora at Riad Zamane in Fez. Apologies for the flash photography – the lantern lit courtyard of my Riad was so beautiful, but a pesky food bloggers nightmare. 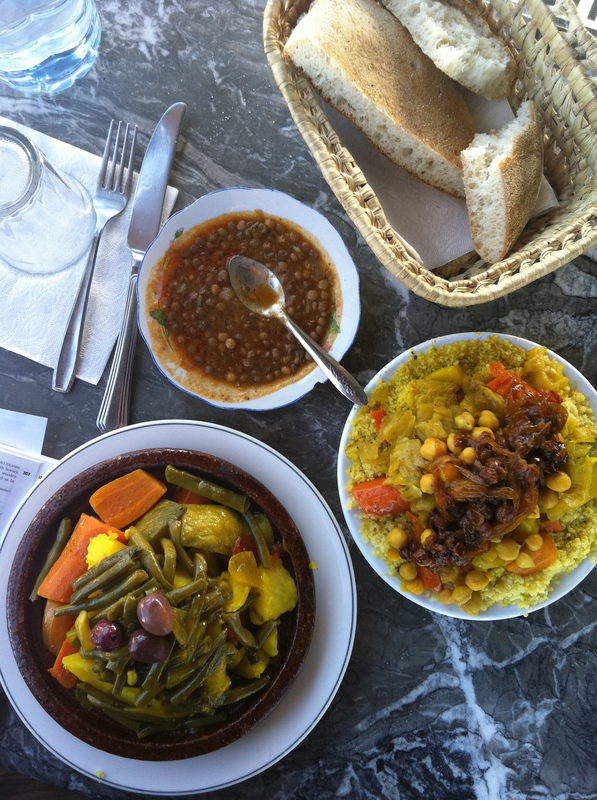 Tagine with vegetables and sweet cous cous: Nothing amazing, but a great view from the Cafe Kasbah rooftop terrace to people watch in the Fez medina at sunset. My first taste of sweet cous cous – topped with cinnamon spiced caramelised onions and sultanas. 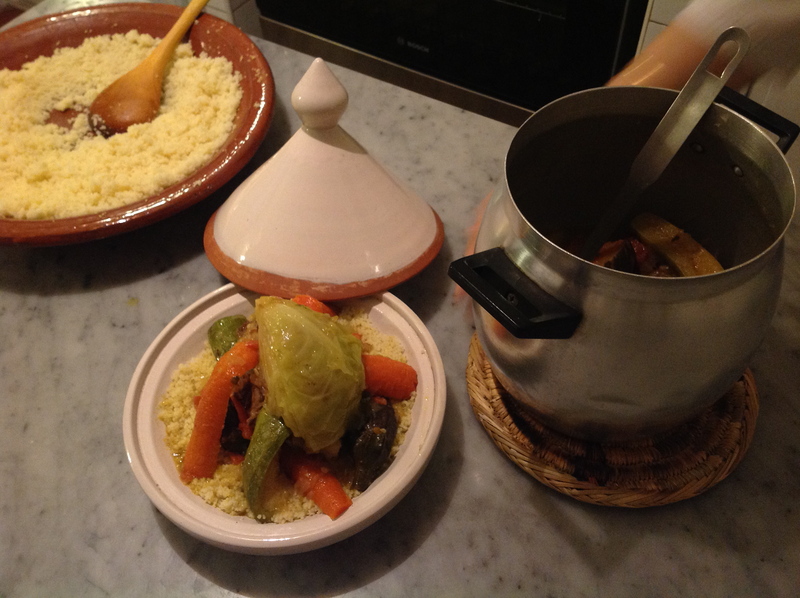 Tagine with lamb and vegetables and cous cous: Prepared as part of my cooking class at Riad Dar Attajmil in Marrakech. It was up there with one of the best, and not just because I had a hand in making it! 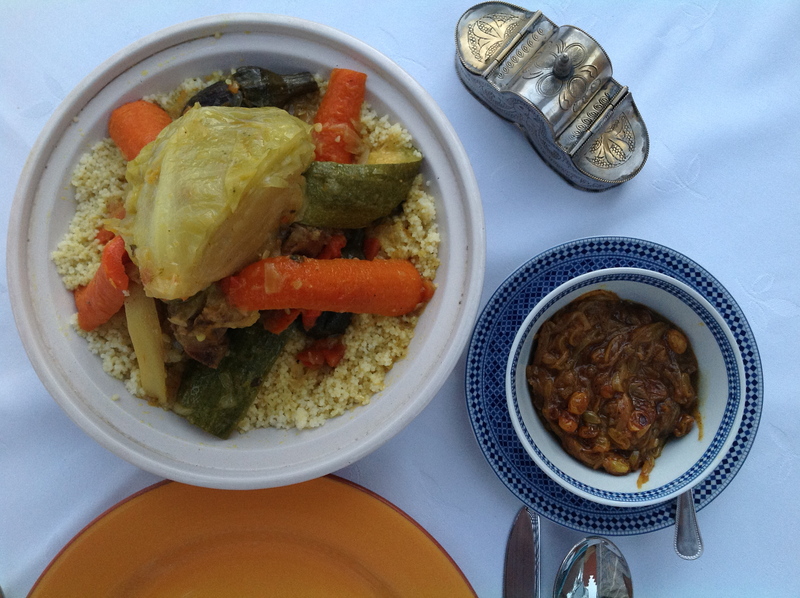 Tagine with chicken and vegetables: Wins the award for best tasting tagine. Made “in the house”, at the Berber village of Andz, near Ourgiane in the Atlas Mountains, using only what was in their garden. Delicious. Cous cous with beef: It was Friday in Agdz, enroute to the Sahara. So I had cous cous and took a nap in the car. Good cous cous. 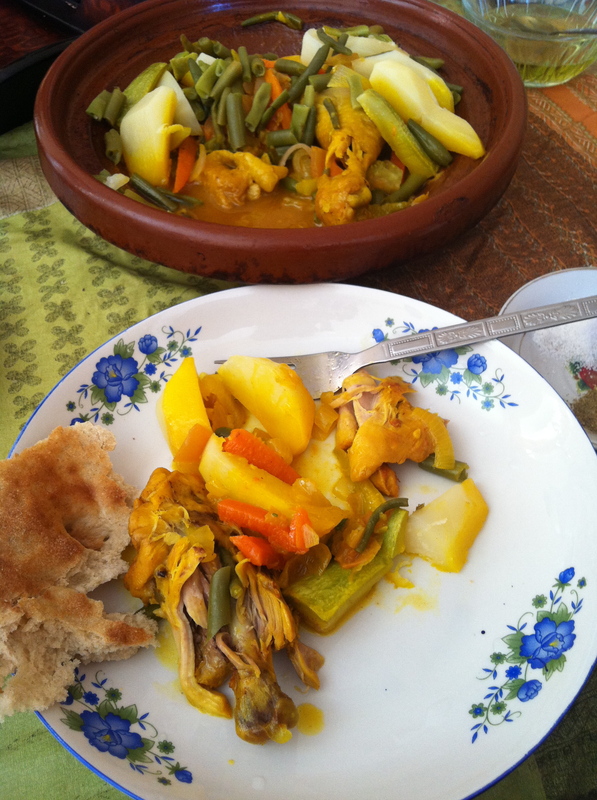 Tagine with chicken and orange: I had this for lunch after emerging from two days in the Erg Chigaga desert. The boys at our camp had cooked us beef tagine for dinner the night before, but sitting under the stars, taking photos of my food was the furthest thing from my mind (for once). The oranges were so soft, like chicken in citrus onion jam. 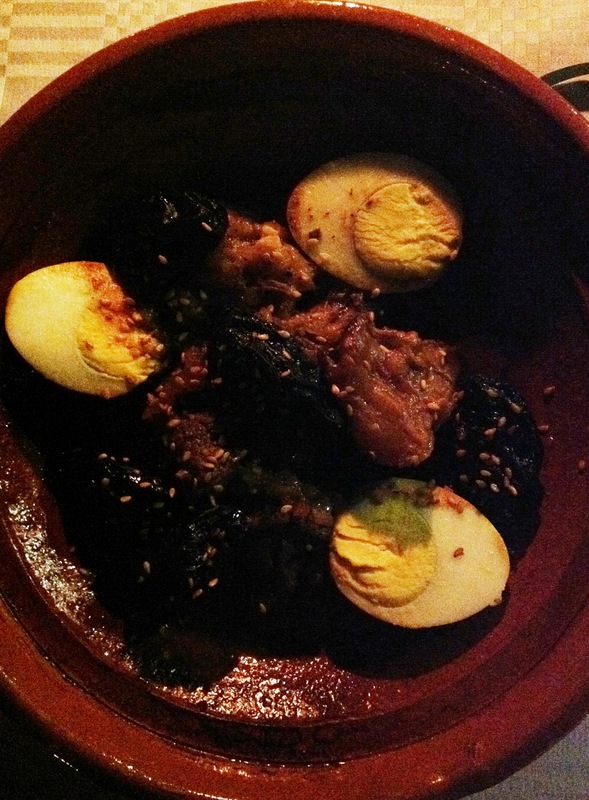 Tagine with beef, prunes and egg: At this point, I’m thinking I might be all tagined-out. 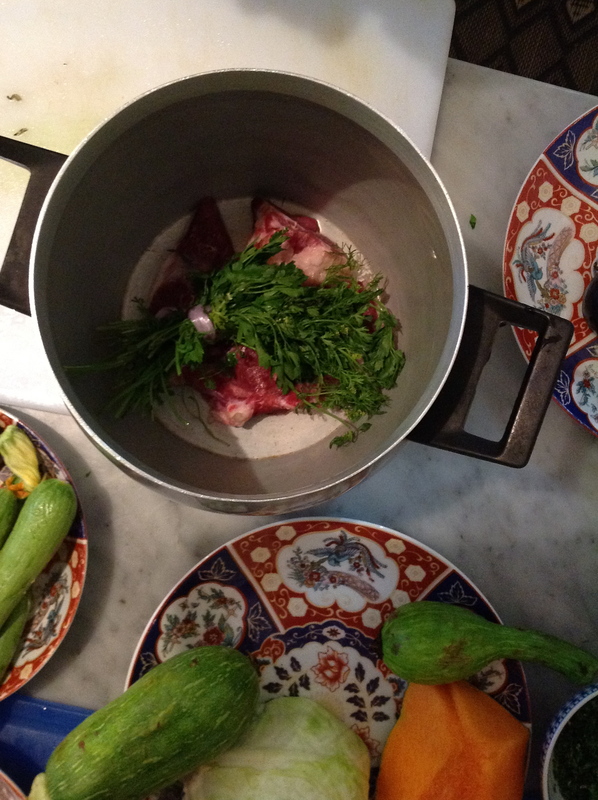 The meat isn’t on the bone, like all the others that have come before it, preferring slow cooked beef cheeks. Although tasty and enjoyed in the stunning gardens on Le Jardines de Skora, I don’t get the feeling this was a one-pot-wonder. 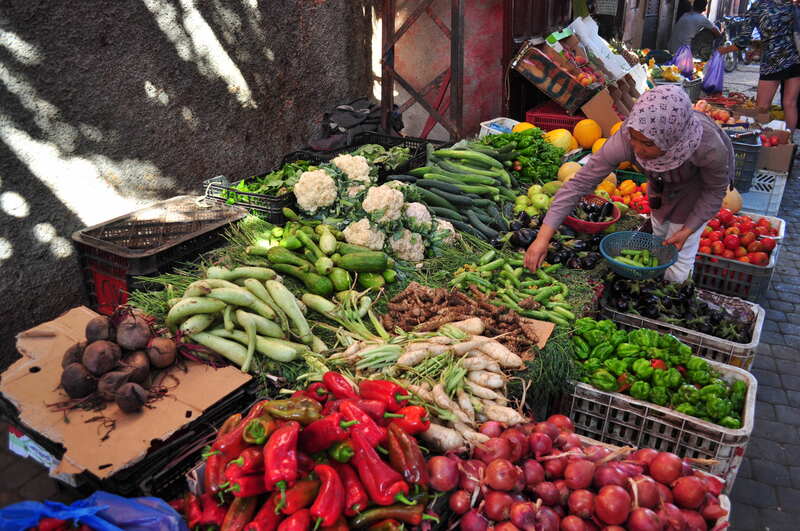 Moroccan girls are taught everything they need to know about cooking, and life, by their mothers. And by the age of 12, a girl should know it all. 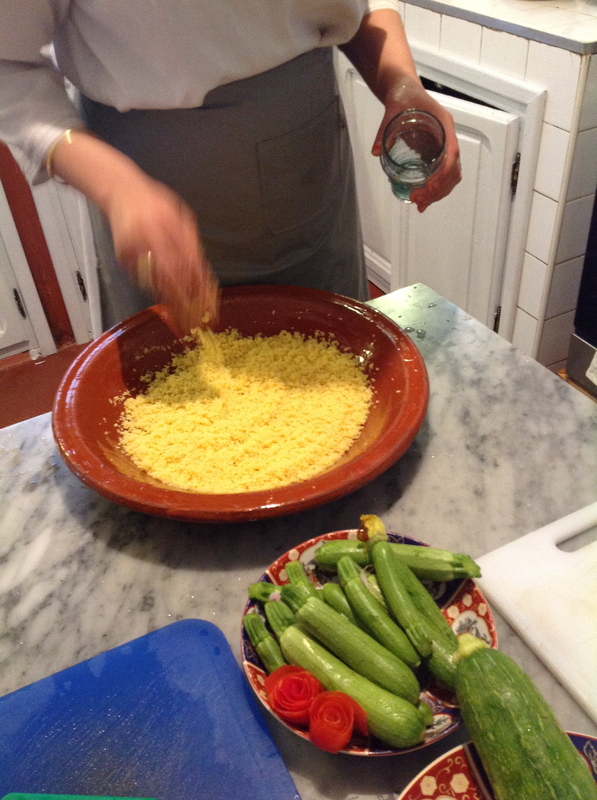 That includes everything I learnt to cook in the kitchen of my Riad Dar Attajmil, in Marrakech. Knowing this, I’m in good hands with Ghzelan and Mouniya. The only recipes we’re following are the ones in the girls heads. This is how they cook. Mouynia takes me shopping at the small market near the medina wall, where the locals shop. We’re a little late in the day so we’ve come to see what vegetables are available for our cous cous dinner. 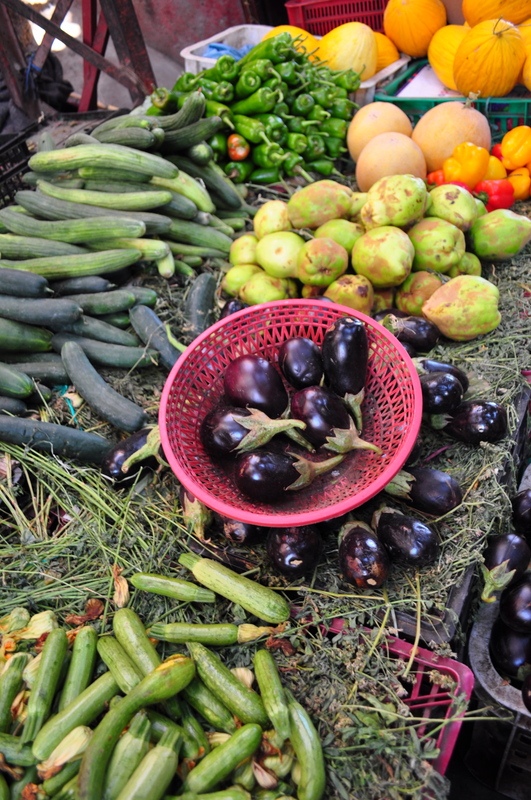 We choose eggplants, pumpkin, swede, cabbage, zucchini, carrots and lamb for the tagine. 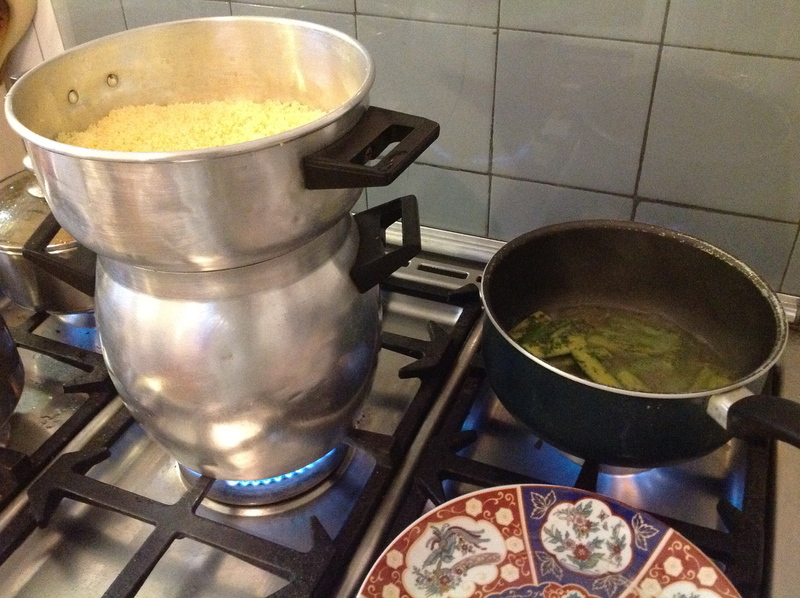 Because we’re making cous cous, we’re cooking with this aluminium pot that has the steamer for the cous cous on top. 02 Oct	This entry was published on October 2, 2012 at 10:41 pm. It’s filed under Delicious and healthy!, LSN, Lucy's plate, Recipes, Uncategorized and tagged Cous cous, Lamb, Morocco, Tagine, Vegetables. Bookmark the permalink. Follow any comments here with the RSS feed for this post.